You’re ready to take to the skies for a little friendly competition, but how do you choose the best drones for racing? If you’re interested in more than just beautiful aerial pictures, and you need something that flies fast, you’re in the right place. Our experts researched and reviewed some of the fastest flying drones on the market to bring you a top ten list, so you can start winning drone races ASAP. Before you make your choice, check out the specifications below, so you end up with the right model. WiFi: WiFi capability will allow you to view the flight from your compatible electronic devices. It also boasts the ability to live stream to social media, or at least directly upload pictures and videos to social media. Headless Mode: This feature is perfect for beginners. It will help you stay in flight until you master the art of manual flying. 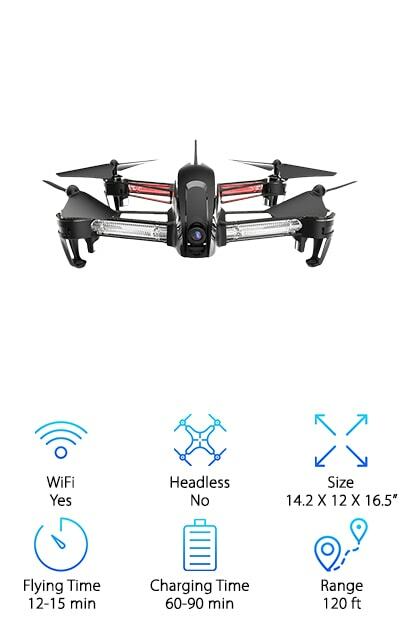 If you’re a novice, check this spec to be sure the drone you like has headless mode. Size: We’ve taken the liberty of jotting down the dimensions for each drone for you, so you know how big the models are. Some are larger and some are small, or mini drones. Check here for the details. Flying Time: You’ll want to know how long each drone can stay in the air, and we’ll tell you. Depending on your needs, you’ll want to check here to make sure the model you’re looking at matches up to your racing pals’ drones. Charging Time: Check this spec to find out how long each drone needs to charge between flights, so you know how long you’ll be waiting to get up and running again between races. Range: It’s important to have a good idea of how far your drone can fly, especially if you plan to race. You don’t want to lose control, while the other drones soar past. Check here for info on each model’s range. Now that you know what to look for while shopping, you’re ready to check out our drone buying guide. Every option on our list is a quality product that has been carefully selected, so you can feel confident in picking the model that most suits your needs. Whether you’re looking for the best racing quad, or you want to check out small racing drones, there’s something for everyone on our list. Let’s get started! Our top pick is the Physport drone. Equipped with a hollow cup 820 motor and capable of 60,000 motor speed, the Physport that offers some of the fastest, most powerful flying experiences around. This drone can fly for eight to nine minutes and features WiFi real-time transmission, allowing you to view images and video, while in flight. Connect this drone to your phone or tablet, or put on VR glasses for an interactive experience. The HD camera produces high-definition, quality images perfect for sharing with friends or reliving your favorite flights and races. Altitude hold and the ability to perform 360 degree flips and tumbles ensure you always get the most interesting shots. 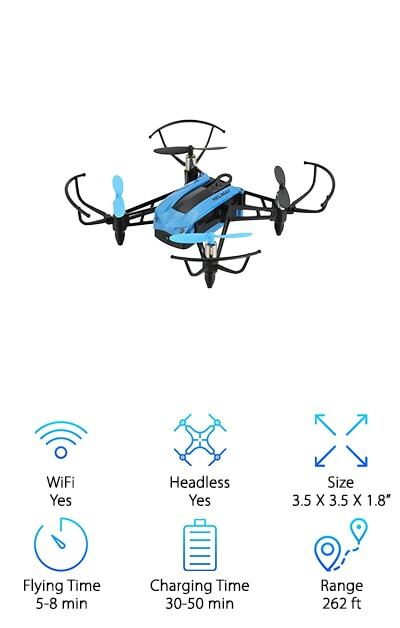 And get this: despite all of the professional features, beginners can take a spin with this drone, thanks to its headless mode capability. One key takeoff and landing make flying this baby a breeze for anyone and a 6-axis design keeps it stable and easy to maneuver. When you’re done flying simply fold it up for easy transport and storage! Our budget pick comes loaded with features sure to please any racing enthusiast. 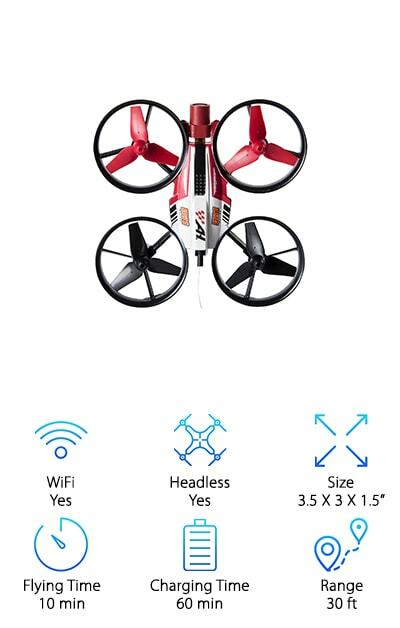 The Air Hogs drone is equipped with WiFi capability that allows you to stream your flight straight to your phone. Even better, an included headset holds your phone in front of your eyes as you race through the sky. Propellers and a crash-resistant frame allow the Air Hogs to tumble and spin with ease and make this drone perfect for novices and seasoned fliers alike. You might be wondering why this premium drone is priced so cheaply. We are, too, because it boasts rave reviews and comes with everything you need for a premium racing experience. Record, edit, and share your best racing images and videos with the free Air Hogs app! You receive a drone, controller, headset, USB charger, and instruction sheet with your purchase to help you get started. Kids and adults will appreciate everything this drone has to offer at a price that won’t break the bank! One of the best mini racing drones we found is the REDPAWZ. When you choose REDPAWZ as your ideal racing companion, your purchase comes with a mini racing drone, remote controller, and compatible goggles that allow you to experience the rush in first person! That's right: your purchase comes with VR goggles! 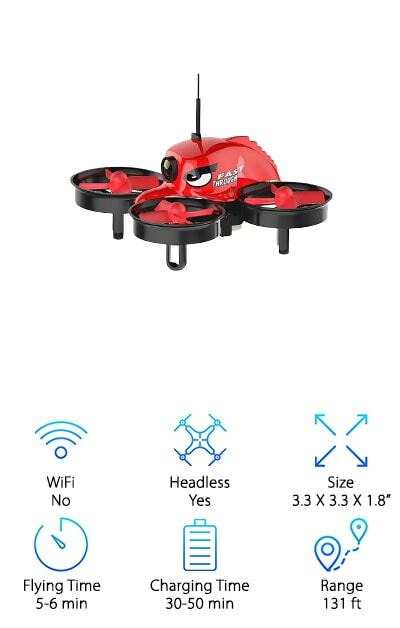 Equipped with headless mode for beginners, one key return, and three speed options, flying this drone is fun and simple. The 6-axis gyroscope provides added stability, so you can determine location changes and set accurate aerial positioning. Move to the left, right, forward, back, and in 360 degree rolls with ease, all while you experience the thrill of the race in virtual reality. The remote control gives you total dominion over how and where your drone goes, allowing you to explore the environment from above and compete in successful races with your pals. The intimidating design lets your competitors know you mean business, giving you an outright advantage from the start! Fun and efficient, this drone has all the right details. Looking for more than a toy, but unwilling to spend top dollar to have a hobby shop custom-build a drone? Well, look no further! The RISE is impressively equipped for instant first person view, meaning it’s ready to fly right out of the box and allows you the ultimate virtual reality experience. 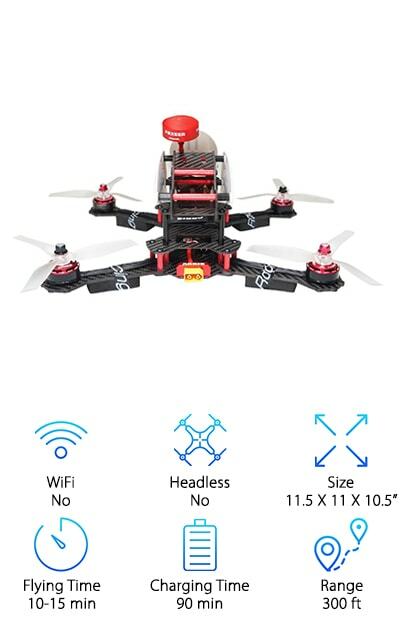 Possibly the best beginner racing drone on the market, this model is constructed with impact-resistant, easy-to-repair materials, which means you don’t have to spend time assembling or soldering it out of the box. And you can immerse yourself in the world of first person view, thanks to the necessary equipment already installed and the included goggles and LCD video monitor. Create the ultimate flying experience with this premium drone, as you soar through the air. Later you can relive your favorite flights, thanks to the micro memory card that allows you to transfer flight footage without sacrificing quality. Packed with power and including everything you need for the flight of your life, the RISE is a great racing companion. The ARRIS comes ready to fly right out of the box! Sleek, black, and designed to look intimidating and serious, you won’t want to miss out on this beast if your goal is drone racing. They assemble, tune, and test this drone before shipping. It features radio controls and a high definition video camera. It is also equipped with several upgrades, including an upgraded motor, propellers, and radio system for ultimate performance. A radiolink AT9S transmitter and lipo battery complete the design for easy communication and lengthy flights. Look and feel like a pro drone racer with this premium model and take then pictures and video to prove it! The carbon siding provides the best racing drone frame for crashes, so it’s a great pick for beginner and intermediate fliers. If you’re ready to take to the skies and you want a drone that looks race-worthy and is capable of top speeds, the ARRIS is perfect for you. Are you ready to take your drone racing to the next level and enjoy speeds up to 30 mph? Bring home the Bolt Drone, and that’s exactly what you’ll be doing. With your choice of three ways to fly this speed demon, including line of sight, screen controller, and first person viewing, you can race your way. Use the WiFi to connect to your smartphone and sync for a live HD feed. Whichever way you choose to fly, you’ll be experiencing the race in real time. If you’re ready for the first person viewing experience, swap the screen into the goggles and prepare to soar the skies yourself. It’s simple to switch between flight styles. Simply slide your smartphone into the goggles for FPV piloting, or put it back on the controller for recreational flying. Snap pics and record with the high definition camera, so you can watch your flights later and share them with friends, too. Made from carbon fiber, the Bolt is durable and can withstand crashing, making it an excellent option for novices and experienced fliers alike. Boasting superior agility and a flight time of twelve minutes, the Goolsky drone is capable of bringing thrills to the table when you’re in the middle of the action of drone racing drone! A lengthy flight time means you enjoy power and speed for longer races. The fun of soaring through the sky and racing doesn’t have to be cut short! Bright LED lights mean you can fly day or night while maintaining a view of the Goolsky. 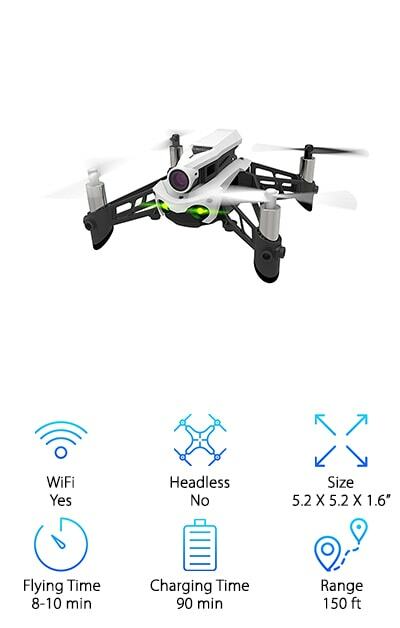 Even better, this super fast drone comes with G3 goggles for a 3D flying experience. Immerse yourself in the world of virtual reality, as you race other drones and view the world from above. 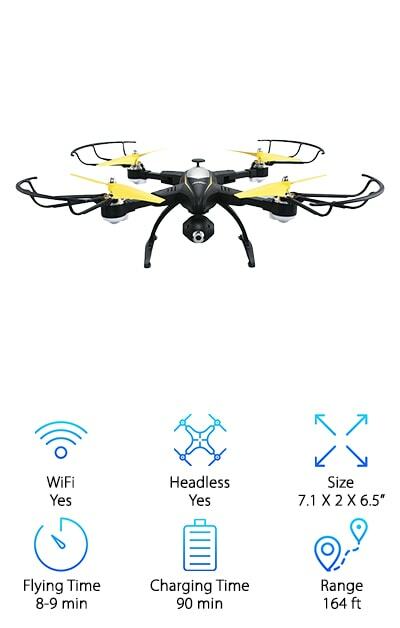 A two-way 2.4 GHz radio controls the drone features weak signal and low voltage alerts. The installed camera allows you take photos and videos of your flights. Share them with friends or display them on the LCD screen attached to the remote controller. If you’re seeking versatility and agility, look no further. Are you new to the world of drone racing? We uncovered a premium racer designed specifically to help newbies learn the art of flying and racing. The Parrot revealed itself during our search, while we hunted for the best racing drones review to cater to beginners. This quality drone is easy and safe to pilot, making it the ideal pick if you’re just starting out. Included with the drone is a pair of cockpit glasses that cater to first person viewing, so you can experience the flight in real-time. Imagine turning the sky into a racetrack and having a front row seat to the action! Better yet, even if you haven’t mastered all the skills for a perfect flight, you glide with ease, thanks to the Parrot Fly pad that allows for precise piloting. And get this: you can download the compatible free flight mini app to unlock different flying experiences when you make the Parrot your new racing drone. Small, but mighty, the Fidget Kit Mini Racing Drone can accelerate up to 30 mph and can perform four-way flips! 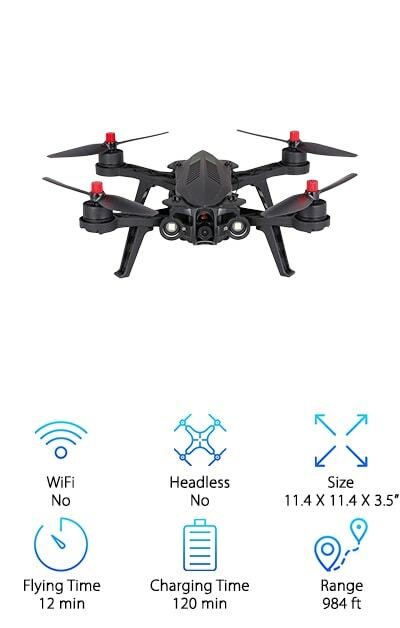 Equipped with a high definition camera, you can sync your smartphone to see what the drone sees, allowing you a front row seat to all the flight action! And snap pics or take video, while flying or racing, for easy sharing with friends! A stable 6-axis gyro and headless mode make this drone an excellent choice for anyone new to drone flying. 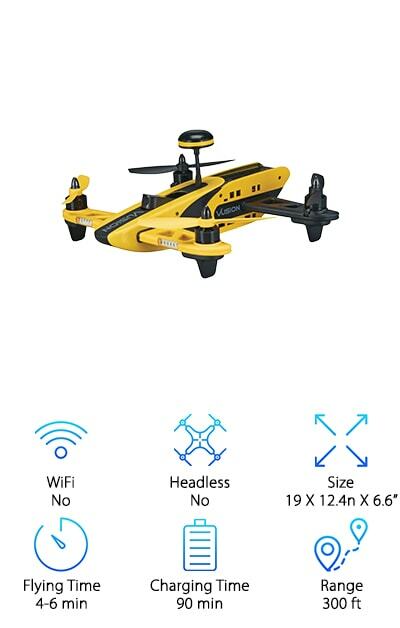 Compatible with smartphone controls, you can use the g-sensor mode to enable this drone to automatically follow the way you tilt your smartphone! High-powered motors provide quick acceleration, but you can slow down thanks to the dual high and low speed modes and stabilize your flight with the altitude hold function. With more than 200 feet of operating range, 24 hour customer services, and a quick charge time of just thirty minutes between flights, the Fidget rounds out our list strong. 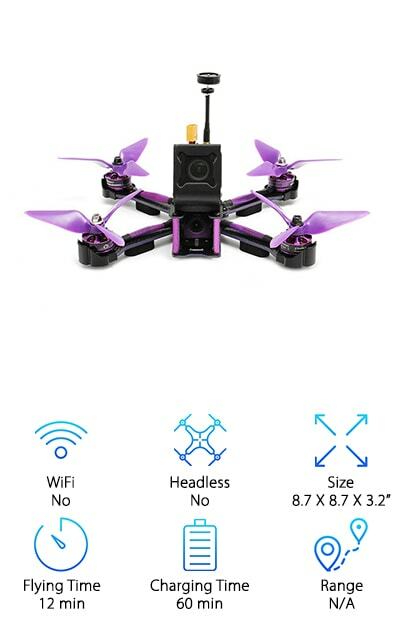 Equipped with a powerful motor and triple-blade propellers, the EACHINE is a top contender when it comes to the best drones for racing. It lands our list, thanks to its countless technological features that give it the ultimate speed and stamina. The triple blades reduce vibration and create stability, ultimately aiding in fast flight. A remote control and receiver allow you to tailor the flight pattern to your liking. And get this: you can take inflight pictures with the 700TVL camera, which is adjustable, allowing you to get shots from different angles. Built as a quadcopter, the EACHINE features four LED indicator lights under each of the propellers. The carbon siding and heavy-duty propellers are designed to withstand many crashes, making this model perfect for beginners and a top choice when you’re looking for a drone with the best quadcopter frame. Even better, the pack comes complete with extra propeller blades, so you’ll enjoy hours of flight time!